At a rough estimate, over 2 million objects from ancient Egypt are kept in about 850 public collections, dispersed over 69 countries around the world. This website aims to collect them into a global virtual museum, which can be visited at any time, from any place. The Global Egyptian Museum is a long-term project, carried out under the aegis of the International Committee for Egyptology (CIPEG). The Basic Mode, currently showcasing 1340 highlights, is geared to the interested public. 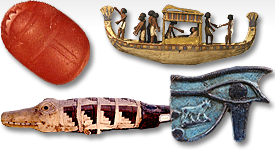 A glossary of more than 400 items explains Egyptian terms and themes. Many objects are provided with audio comments and 3D-movies. The Advanced Mode, equiped with a powerfull search and data entry engine, opens up the full database - presently 14975 objects - to professionals and amateurs. Kids! offers information for children at the age of 8-12 years in an interactive way.